The G Series from Takamine is the talk of the town for many up and coming guitarists, both learners and experts. This series has been developed and put together specifically keeping affordability and quality in mind. The G series is made to be versatile and flexible. It is definitely a range of assorted guitars that you need to know about! 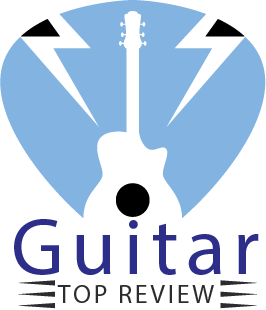 So we are presenting here Takamine G Series review. The GC3-NAT Classical Guitar from Takamine’s G series is the ultimate guitar if your are looking for a beautiful and classic acoustic. The GC3-NAT Classical Guitar comes in natural and showcases a solid-top construction with mahogany neck and rosewood fingerboard. This guitar is really a feast to look at. The glossy finish on the natural wood body is something out of the magazine. The guitar weighs a pinch under 5.5 pounds and measures 42 x 18.3 x 5.1 inches in dimensions. You also have a dovetail neck joint, a synthetic bone nut and bridge saddle, a rosewood head cap and our favorite, chrome tuners with white pearl buttons! But let’s talk music now. The Takamine G Series GC3-NAT Classical Guitar has 6 nylon strings which give off the most beautiful and comfortable sound experience. This, in conjunction with the fan-braced solid spruce top with mahogany back and sides, produce a rich, resonant sound that has to be heard to be believed. The Takamine G Series GC3-NAT Classical Guitar is the perfect place to start if you are beginner and yet, high quality enough to challenge even the most expert of experts. Alright then. If you liked the first acoustic we introduced to you, then you are surely going to be impressed by the next, which is the Takamine GD71-BSB G-Series G70 Acoustic Guitar. 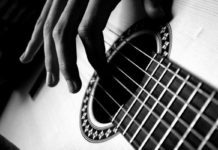 But if you are a beginner and running low on budget then you can go for another affordable acoustic guitar which will definitely save some extra bucks. The Takamine GD71-BSB G-Series G70 Acoustic Guitar features a solid body construction with a dreadnaught body. This guitar weighs about 18 pounds and measures along the lines of 48 x 22 x 8 inches in dimensions. The Takamine GD71-BSB is definitely a little bulky, but it is all in the name of quality. You have a solid spruce top and mahogany back and sides which makes for an ideal tonewood for this guitar. You also have a mahogany neck, a rosewood fingerboard, a rosewood head cap, an abalone sound-hole rosette, maple dot fret inlays and gold die-cast machine heads with amber tuning buttons. It is also a very good-looking guitar if that’s a criteria for you. You have a black body with a brown sunburst and glossy finish. All in all, the overall sound output from the Takamine GD71-BSB acoustic guitar is just the right guitar for people who are looking for something that produces refined yet bold sounds. That’s for our first couple of acoustics for now. We know many people are into the hybrids so let’s take a look into an acoustic and electric from Takamine, starting with their very popular G Series EG5013S-VFT OM Flame Maple Acoustic-Electric Guitar. The G Series EG5013S-VFT OM Flame Maple Acoustic-Electric Guitar features an OM body and a solid spruce top. You have flamed maple back and sides and a rosewood fretboard. All these combination of woods, make for a very high quality and coated tonewood for the G Series EG5013S-VFT OM Flame Maple Acoustic-Electric Guitar that you’ll want to listen to over and over again. The OM shape or orchestral model shape give the guitar its strong lower midranges and very versatile dynamics. Thanks to the smaller length of this guitar, it is very popular for acoustic and finger style players. Alright. Now let’s get to the electric part! The Takamine G Series EG5013S-VFT OM Flame Maple Acoustic-Electric Guitar with a TK40 preamp which gives you a tunable notch filter and switchable midrange contour. The versatility with this guitar is unmatched! As for the looks, it is nothing over the top, but still, very standout and elegant. You have a brown sunburst and glossy finish which looks very old-school and vintage. Definitely something you’ll like showing off! If you are looking for an acoustic and electric combo, then the Takamine GD93CE NAT G Series Dreadnought Cutaway Acoustic is right up your alley! This guitar is just right for people who are looking to go back and forth the various sound profile, and the best part? It is a whole and complete set! The Takamine GD93CE NAT G Series Dreadnought Cutaway Acoustic and electric guitar features a super resonant solid spruce top with scalloped X-bracing provides incredible volume and projection. As for the tonewood, you have a 3-piece rosewood back with maple center which produce deep, rich and crisp sound outputs. You have a mahogany neck with rosewood fingerboard, 20 nickel-silver frets and dot inlays. This guitar is weighs a hair above 11 pounds and measures 43.2 x 19.8 x 5.8 inches in dimensions; pretty comfortable to use, we’d say. Now, let’s talk the electric part. The Takamine GD93CE NAT G Series comes with a TK-40D preamp system. And boy does it get loud! But the best part about this guitar is that it comes with the all the things you will need to get started immediately. You get a clip on tuner, guitar stand, guitar strap, guitar picks and zorro sounds guitar polishing cloth. If you are looking for a versatile guitar that come with a good set-up, then the Takamine GD93CE NAT G Series is your guy. We have also reviewed another brand Dreadnought Cutaway Acoustic Electric Guitar with all necessary base features at a comfortable price. You can check that, too. Alright, alright. We all know the struggles left-handed have to face with musical instruments like guitar. But don’t worry about that anymore because Takamine has got you covered with their GB30CELH-NAT G-Series Left Handed Acoustic Electric Bass Guitar. If you are looking for an acoustic electric and bass magic that’s no less than a pro grade, then this just might be it for you. The GB30CELH-NAT G-Series Left Handed Acoustic Electric Bass Guitar measures 48 x 22 x 8 inches in dimensions and weighs no more than 18 pounds. It is very easy to and comfortable to use, and is, no doubt, a killer good looker with its natural wood look and glossy finish. Very old-school. Now, let’s talk construction. The GB30CELH-NAT G-Series Left Handed Acoustic Electric Bass Guitar features a solid spruce top and a mahogany back. You have mahogany sides and neck. As for the fingerboard, you have beautiful rosewood doing its magic. The GB30CELH-NAT G-Series Left Handed Acoustic Electric Bass Guitar also features a TK-4OB preamp with a built-in tuner, a 3-band EQ and gain controls, mid-shift control, bass boost switch, and EQ bypass switch. The overall sound profile of this guitar is versatile and generous. There’s amazing sound resonance and yet so much crispness and precision going on. If you are looking for a versatile left-handed combo guitar that is stage-worthy and no less than so, then the Takamine GB30CELH-NAT G-Series Left Handed Acoustic Electric Bass Guitar is the thing of dreams! If the GB30CELH-NAT didn’t make the cut for you, then we are sure our next contender will. Say hello to yet another godsend left-handed guitar with the Takamine GC1CELH-NAT Left Handed G-Series Classical Acoustic Electric Guitar! The Takamine GC1CELH-NAT Left Handed G-Series Classical Acoustic Electric Guitar measures 48 x 22 x 8 inches dimensions and weighs 18 pounds. It is hybrid guitar, meaning you will get the best of a classical, an acoustic and an electric guitar. It can’t get any more generous than this! Anyway, moving on to the construction aspect of this guitar. You have a classical fan-braced body with a spruce top and mahogany sides and back. You also have a dovetail neck joint, a beautiful inlaid mosaic rosette, synthetic bone nut and bridge saddle, rosewood headcap, and chrome tuners with white pearl buttons. Apart from this, you also have a mahogany neck and finger board. The overall construction is fantastic and robust and the choice of tonewood along with the fabulous nylon strings, really give this guitar a coveted sound profile. Coming to the electronic aspect of this guitar, the GC1CELH-NAT Left Handed G-Series Classical Acoustic Electric Guitar comes with the very popular TP-E preamp system which offers you a built-in tuner that comes with volume and tone controls; and a mid-cut switch. Very neat! Now, it’s time for a classical guitar to shine. For people who are specifically looking for classical guitars only, we have for you, the very popular GC3-BLK G-Series Classical Guitar in Black Finish! The GC3-BLK G-Series Classical Guitar is 48 x 22 x 8 inches and 18 pounds of pure audio bliss. This guitar features a fan-braced classical body shape with a solid spruce top. You also have its back and sides made out of mahogany which makes for an amazing tonewood for classical guitars. As for the rest, the neck is made out of mahogany while the fret board is from rosewood. You also have a dovetail neck joint, a synthetic bone nut and bridge saddle, a rosewood headcap, a chrome tuners with white pearl buttons. All these, in combination with the reliable and rich nylon-strings, create a sound profile that has to be heard to be believed. On top of this, the Takamine GC3-BLK G-Series Classical Guitar combines TK-4OB preamp with onboard chromatic tuner to offer you the most versatile range of tones. As for the aesthetics, the Takamine GC3-BLK G-Series Classical Guitar comes in a beautiful black and glossy finish which is worth every look. This is definitely one classical guitar you want to take seriously! Next up on our list of the G series, we have yet another jackpot guitar for landed players who are looking for an instrument that is no less than any professional level stuff. It is the Takamine GB30CELH-BLK G-Series Left Handed Acoustic Electric Bass in Black Finish, and it is here to wow you! The Takamine GB30CELH-BLK G-Series Left Handed Acoustic Electric Bass guitar measures 48 x 22 x 8 inches in dimensions and 18 pounds in weight. It has a bass body shape and a solid spruce top with mahogany back and sides. As for the neck, it uses mahogany as well and you have a rosewood finger board. With a tonewood this deadly in combination, you know the Takamine GB30CELH-BLK guitar is bound to be a wow-er! The subtle Venetian-style cutaway is also an eye-catcher. But that’s not all. You also have a dovetail neck joint, a synthetic bone nut and bridge saddle, rosewood headcap, pearl dot fingerboard inlays, abalone rosette, and chrome die-cast tuners. Now, for the electric part. You get a Takamine TK-40B preamp system with the GB30CELH-BLK G-Series guitar. This preamp system is no less in any way. You have a built-in tuner, three-band EQ and gain controls, mid-shift control, bass boost switch and an EQ bypass switch which offers you a wide range of tones and sound profiles. Last but not least, the Takamine GB30CELH-BLK G-Series guitar is quite the showstopper too. This guitar comes in all black and has a glossy finish. Very modern looking yet very subtle and statement-worthy. The next name to grace our list of the Takamine G-series is a guitar for people who like it low-profile, subtle, soft and yet, very high performance. It is the Takamine GD90CE-ZC Dreadnought Acoustic Electric Guitar in Natural. If you are looking for an acoustic electric guitar that does not scream, but says everything through its performance, then this is it. At first sight, it looks like your average boring old guitar at 48 x 22 x 8 inches and 18 pounds in weight. But you have to play it to admire it. This is one guitar on our list that uses a different combination of tonewood than what we have been seeing for far. The Takamine GD90CE-ZC Dreadnought Acoustic Electric Guitar has a solid spruce top and ziricote back and sides. You have a mahogany neck and a rosewood finger board. This guitar also uses a maple binding, abalone inlay and rosette, and cool old-school gold open-gear butterbean tuners. As for the electric aspect of the guitar, you get a TP4TD preamp system to go with it. As for the looks, it’s pretty basic and standard until you turn it around to see the beautiful, grains of the ziricote wood under a glossy finish that shines like clear water. What’s nice is that this guitar comes with a gig bag which makes carrying the thing so much easier. We also appreciate the full manufacturer warranty that you get with the Takamine GD90CE-ZC Dreadnought Acoustic Electric Guitar. We have been getting request for Takamine G Series review and also for cutaway acoustic electric guitars like there’s no tomorrow. Out of all the ones we have scoured through for you, the Takamine GC5CE-NAT Acoustic Electric Classical Cutaway Guitar is surely a stand out! The Takamine GC5CE-NAT Acoustic Electric Classical Cutaway Guitar measures 42 x 6 x 19 inches in dimensions and weighs just 10 pounds! It is hands down of the most lightweight and easy-going guitars on our Takamine G series list today. Easy, comfortable and ideal for beginners! Let’s move on to the construction. The GC5CE-NAT Acoustic Electric Classical Cutaway Guitar has a classical cutaway body shape with a solid spruce top. You also get rosewood back and sides and a rosewood fret board too. As for the neck, it is made from high quality mahogany. Definitely a tonewood worth your penny! You also have a dovetail neck joint, beautiful inlaid mosaic rosette, synthetic bone nut and bridge saddle, rosewood headcap, and gold tuners with white pearl buttons. As for the preamp on this guitar, you are getting the tp-4t preamp which features 3-band eq and built-in tuner for added range of tones and versatility. The Takamine GC5CE-NAT Acoustic Electric Classical Cutaway Guitar is quite handsome too. It has natural glossy finish which looks very classy and old-school. The gold hardware finish against the natural amber body of the guitar is definitely something too! And the final name which make up the prestigious list of the Takamine G series review is the ever popular Takamine G Series GB30CE-BLK Jumbo Acoustic Electric Bass Guitar! The Takamine G Series GB30CE-BLK Jumbo Acoustic Electric Bass Guitar is a dream in reality for many guitarists. This jumbo guitar measures 50 x 21 x 6.5 inches in dimensions and weighs less than 10 pounds! It has a bass body shape, Venetian-style cutaway with a Quartersawn “X” bracing. You have a solid spruce top with mahogany back and sides and neck. As for the fret board, it is made out of rosewood. You also have a dovetail neck joint, synthetic bone nut and bridge saddle, rosewood headcap, pearl dot fingerboard inlays, abalone rosette, and chrome die-cast tuners. As for the preamp, you get the TK-40B with onboard chromatic tuner which offers you three-band EQ and gain controls, mid-shift control, bass-boost switch and EQ bypass switch. The Takamine G Series GB30CE-BLK Jumbo Acoustic Electric Bass Guitar is also one of our most good-looking guitars on the list! It has a beautiful black body with a glossy finish and just the right texture which gives this guitar a very high-class and mysterious aura. Just what we like! Let’s check sound of Takamine G Series Guitar from a Southerner! So, there you have it folk! The Takamine G Series! We have created this list introducing you to some of the most versatile guitars in the market. The Takamine G series is made using you in mind! It is made to provide high quality experience for an affordable price for the mass. A wide range and selection of guitars is also going to satisfy your on-stage demands. 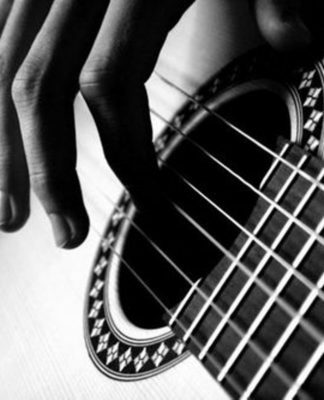 Take a look through and choose what your fingers strum to. Cheers!